Honda Water Pressure Washer VS Very Dirty LAND ROVER! - Muscle Cars Zone! Honda Water Pressure Washer VS Very Dirty LAND ROVER! Having the proper tools to help keep your vehicle in pristine condition is important but anyone could do it hence some of them are extremely expensive. Nonetheless, only by keeping your car nice and clean you can extend its lifetime and avoid any potential rust, and this is especially true for those off road trucks that get dirty all the time. Anyway, we hereby check out this video in which we see what the Honda water pressure washer is actually capable off. The washer is facing a difficult task hence it has to wash down this extremely dirty Land Rover that is covered in mud. But the Honda washer looks ready for the challenge and is certain that nothing can stand on its way. And so it begins! The man uses the extremely powerful water pressure water to first simply rinse off any big chunks of mud from the body and the wheels. Then it is time to cover the whole vehicle with foam that is easily sprayed using the same tool. After couple of minutes soaking in it, it was time to wash it off and reveal the difference. It takes just couple of minutes to get every bit of foam and dirt off the Land Rover. You can clearly tell the difference hence this vehicle looks like brand new now. 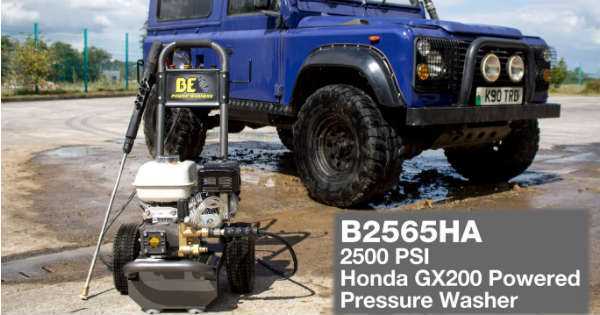 The machine is called Honda GX200 water pressure washer and has whooping 2,500 PSI. What do you think; can anything stand on its way? Finally, to see what can the dustless blaster do -- click here!